Petrologically, soapstone is composed dominantly of talc, with varying amounts of chlorite and amphiboles (typically tremolite, anthophyllite, and cummingtonite, hence its obsolete name, magnesiocummingtonite), and trace to minor iron-chromium oxides. It may be schistose or massive. Soapstone is formed by the metamorphism of ultramafic protoliths (e.g. dunite or serpentinite) and the metasomatism of siliceous dolostones. By mass, "pure" steatite is roughly 63.37% silica, 31.88% magnesia, and 4.74% water. It commonly contains minor quantities of other oxides such as CaO or Al2O3. Pyrophyllite, a mineral very similar to talc, is sometimes called soapstone in the generic sense, since its physical characteristics and industrial uses are similar, and because it is also commonly used as a carving material. However, this mineral typically does not have such a soapy feel as soapstone. 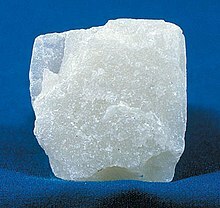 Soapstone is relatively soft because of its high talc content, talc having a definitional value of 1 on the Mohs hardness scale. Softer grades may feel similar to soap when touched, hence the name. No fixed hardness is given for soapstone because the amount of talc it contains varies widely, from as little as 30% for architectural grades such as those used on countertops, to as much as 80% for carving grades. Soapstone is often used as an insulator for housing and electrical components, due to its durability and electrical characteristics and because it can be pressed into complex shapes before firing. Soapstone undergoes transformations when heated to temperatures of 1000–1200°C into enstatite and cristobalite; on the Mohs scale, this corresponds to an increase in hardness to 5.5–6.5. Ancient Egyptian Scarab signet/amulets were most commonly made from glazed steatite. Soapstone is used for inlaid designs, sculpture, coasters, and kitchen countertops and sinks. The Inuit often used soapstone for traditional carvings. Some Native American tribes and bands make bowls, cooking slabs, and other objects from soapstone; historically, this was particularly common during the Late Archaic archaeological period. Locally quarried soapstone was used for gravemarkers in 19th century northeast Georgia, US, around Dahlonega, and Cleveland, as simple field stone and "slot and tab" tombs. Small blocks of soapstone (8" x 10" x 1") were heated on the cookstove or near the fire and used to warm cold bedclothes or to keep hands and feet cozy while sleighing. Vikings hewed soapstone directly from the stone face, shaped it into cooking pots, and sold these at home and abroad. Soapstone is sometimes used for construction of fireplace surrounds, cladding on wood-burning stoves, and as the preferred material for woodburning masonry heaters because it can absorb, store, and evenly radiate heat due to its high density and magnesite (MgCO3) content. It is also used for countertops and bathroom tiling because of the ease of working the material and its property as the "quiet stone". A weathered or aged appearance occurs naturally over time as the patina is enhanced. The ancient trading city of Tepe Yahya in southeastern Iran was a center for the production and distribution of soapstone in the fifth to third millennia BC. It was also used in Minoan Crete. At the Palace of Knossos, archaeological recovery has included a magnificent libation table made of steatite. The Yoruba people of West Nigeria used soapstone for several statues, most notably at Esie, where archaeologists have uncovered hundreds of male and female statues about half of life size. The Yoruba of Ife also produced a miniature soapstone obelisk with metal studs called superstitiously "the staff of Oranmiyan". In Brazil, especially in Minas Gerais, due to the abundance of soapstone mines in that Brazilian state, local artisans still craft objects from that material, including pots and pans, wine glasses, statues, jewel boxes, coasters, and vases. These handicrafts are commonly sold in street markets found in cities across the state. Some of the oldest towns, notably Congonhas, Tiradentes, and Ouro Preto, still have some of their streets paved with soapstone from colonial times. Some Native Americans use soapstone for smoking pipes; numerous examples have been found among artifacts of different cultures and are still in use today. Its low heat conduction allows for prolonged smoking without the pipe heating up uncomfortably. Some wood-burning stoves make use of soapstone to take advantage of its useful thermal and fire-resistant properties. Soapstone is also used to carve Chinese seals. Currently, soapstone is most commonly used for architectural applications, such as counter tops, floor tiles, showerbases, and interior surfacing. The active North American soapstone mines include one south of Quebec City with products marketed by Canadian Soapstone, the Treasure and Regal mines in Beaverhead County, Montana mined by the Barretts Minerals Company, and another in Central Virginia operated by the Alberene Soapstone Company. Architectural soapstone is mined in Canada, Brazil, India, and Finland and imported into the United States. Soapstones can be put in a freezer and later used in place of ice cubes to chill alcoholic beverages without diluting. Sometimes called whiskey stones, these were first introduced around 2007. Most whiskey stones feature a semipolished finish, retaining the soft look of natural soapstone, while others are highly polished. Steatite ceramics are low-cost biaxial porcelains of nominal composition (MgO)3(SiO2)4. Steatite is used primarily for its dielectric and thermal insulating properties in applications such as tile, substrates, washers, bushings, beads, and pigments. It is also used for high-voltage insulators, which have to stand large mechanical loads, e.g. insulators of mast radiators. People can be exposed to soapstone in the workplace by breathing it in, skin contact, or eye contact. The Occupational Safety and Health Administration has set the legal limit (permissible exposure limit) for soapstone exposure in the workplace as 20 million particles per cubic foot over an 8-hour workday. The National Institute for Occupational Safety and Health has set a recommended exposure limit of 6 mg/m3 total exposure and 3 mg/m3 respiratory exposure over an 8-hour workday. At levels of 3000 mg/m3, soapstone is immediately dangerous to life and health. Combarbalite stone, exclusively mined in Combarbalá, Chile, is known for its many colors. While they are not visible during mining, they appear after refining. ^ Anthony, John W.; Bideaux, Richard A.; Bladh, Kenneth W.; Nichols, Monte C., eds. (1995). "Talc". Handbook of Mineralogy (PDF). II (Silica, Silicates). Chantilly, VA: Mineralogical Society of America. ISBN 0962209716. ^ Virta, Robert L. Minerals Yearbook Metals and Minerals 2010. Government Printing Office. p. 75.1. Retrieved 26 November 2018. ^ "Some Important Aspects of the Harappan Technological Tradition," Bhan KK, Vidale M and Kenoyer JM, in Indian Archaeology in Retrospect/edited by S. Settar and Ravi Korisettar, Manohar Press, New Delhi, 2002. ^ Aldred, Cyril (1971). Jewels of the Pharaohs Egyptian Jewellery of the Dynastic Period. Thames and Hudson. pp. 160–161. ISBN 0500231389. ^ Kenneth E. Sassaman (1993-03-30). Early Pottery in the Southeast: Tradition and Innovation in Cooking Technology. University Alabama Press. ISBN 978-0-8173-0670-0. ^ a b Weideman, Paul (2017-11-05). "There's a stove for every taste". The Santa Fe New Mexican. Retrieved 2017-12-14. ^ a b Damrosch, Barbara (2017-01-19). "The enduring appeal of wood stoves". The Washington Post. Retrieved 2017-12-14. ^ Barnett, Antony (2003-06-22). "West's love of talc threatens India's tigers". The Guardian. London. Retrieved 2007-01-09. ^ Witthoft, J.G., 1949, "Stone Pipes of the Historic Cherokees", Southern Indian Studies 1(2):43–62. ^ "Soapstone gives countertops, tiles a look that's both new and old". The Washington Post. Retrieved 2014-01-11. ^ "Royalty Minerals". www.royaltyminerals.in. Retrieved 26 November 2018. ^ "Superior Technical Ceramics". Retrieved 26 November 2018. ^ "CDC - NIOSH Pocket Guide to Chemical Hazards - Soapstone (containing less than 1% quartz)". www.cdc.gov. Retrieved 2015-11-21. ^ "CST Personal Home Pages". www.cst.cmich.edu. Retrieved 26 November 2018. Wikimedia Commons has media related to Soapstone.